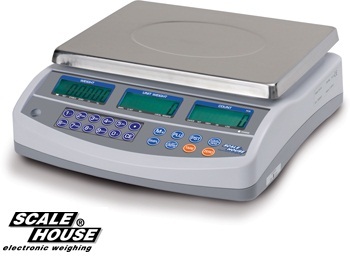 NOTE: in order to realize this configuration, you have to order one SHCAL calibration service for the reference scale and one for the counting scale. Counting scale, CONNECTABLE TO A SECOND REMOTE PLATFORM, particularly suitable for taking inventories and for counting small parts. Weight or piece quantity check, weight and pieces' totalisation function, 100 PLU memory. 3 backlit LCD displays with 6 digits 20mm high for simultaneously viewing weight, average piece weight, and number of pieces. Membrane waterproof, alphanumeric and functional keypad with 20 keys and acoustic feedback. Built-in rechargeable battery (about 70h battery life) and 230Vac power adapter. Configurable input for connection to second counting platform, with completely programmable capacity and division. Packaging: 440x370x220mm size - approximate weight of 5,5kg. NOTE: available connection to a second remote platform of SCALE HOUSE series. If a second remote platform is ordered, you have to purchase 2 SHCAL calibration services: one for the reference scale and one for the counting scale. SHAL13 12V 500mA power supplier (EU). 15BCSDC Moulded protective covers in transparent plastic.